Barcelona, together with London and Paris, leads top 3 in most visited cities in the European Union. 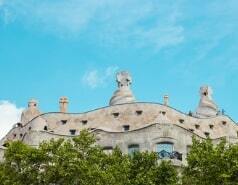 Barcelona is a city with a special personality, a city which fascinates all its visitors. Its charm is so special that many movie directors have chosen it for the different settings in which their films have been developed. Woody Allen, Tom Tykwer or Pedro Almodóvar are some of them. Vicky, Cristina, Barcelona, directed by Woody Allen, is about two American girlfriends who arrive in Barcelona for a summer holiday and tells the relationship with an eccentric local painter. 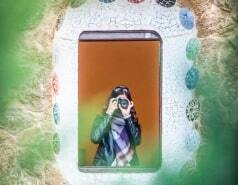 Some of the settings were La Pedrera, Park Güell and Hospital de Sant Pau. Another famous movie that was filmed in Barcelona is Perfume: The Story of a Murderer, directed by Tom Tykwer. This film was based on Patrick Süskind’s novel Perfume and tells the story of a murderer who wanted to capture the scent of his victims. The most curious fact is that it was filmed in Barcelona but the setting represented Paris at Middle Ages. Some of the settings were Plaça Reial, Plaça de Felip Neri or Carrer del Bisbe. Another great movie filmed in Barcelona, in this case a Spanish movie, is All About My Mother, by Pedro Almodóvar. It is a film which tells the adventure of a single mother from Madrid who decides to move to Barcelona after the death of her son in order to look for his father. Some points of interest appearing in the movie are the Columbus Monument, Sagrada Familia or Palau de la Música. If you like cinema and want to visit these settings, we advise you our official tourist bus service. Thanks to our both routes (East and West) you will be able to move around Barcelona, hop on and off the bus and change of route as many times as you want. 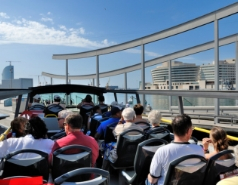 Do not miss the most cinematographic side of the city with Barcelona City Tour.